To understand what makes the live collection It’s Too Late to Stop Now so momentous, its context in Van Morrison’s career must be taken into account. Nowadays Van Morrison conjures up visions of a chubby man in a suit who sits on a stool while on stage, whereas the Van Morrison of 1973 was coming off what may be one of the most-overlooked string of releases from the ’60’s and 70’s. From Astral Weeks, to Moondance, to His Band and the Street Choir, to Tupelo Honey, to Saint Dominic’s Preview — Van Morrison didn’t just release albums that would yield songs for greatest hit collections years later — he put out his greatest records. Strong, well-rounded, lyrically complex and beautiful, more musically rich and ranging than he and his band are ever given credit for; it’s a run that is nearly unparalleled in music. It’s not that It’s Too Late is forgotten, far from it. It’s that it is one of those rare live-gems that redefines a musicians work. In this case, over and over and over. There’s the soul-infused version of “Warm Love” and the funky-blues of “Domino” and “These Dreams of You,” — there’s the quiet bliss of “Listen to the Lion.” Every track stands up to the original. This is more than a live record, it is its own record – not a compilation but an entry into the cannon, fully and whole-heartedly. If there’s one track that stands out (and it’s hard to pass over the classic “Caravan” which has more raw energy than probably any performance Van, or many artists, have ever given) it’s the closer, “Cyprus Avenue.” A track that, in it’s original setting is a harpsichord-heavy free-jazz odyssey, it becomes emotional dynamite – mixing love, genius lyricism and a stage-flair that transcends an audio-only experience but most importantly, is a beautiful song that you could rock out or fall asleep to. + L.A. Folks: I have three pairs of tickets to Giant Sand to giveaway for the October 8th show at The Echo. Leave a comment with you favorite Van Morrison track if you’d like a pair. First come, first served. You hit it on the nose! Van is one of the greatest and most under rated artist of this time. He takes you back with a feeling of pure soul and goodness. A type of moment that you and your parents don’t disagree about. So glad you put a spotlight on this album. I only knew Van from the radio until one of my friends gave me “It’s Too Late To Stop Now.” It changed my entire outlook on him and the album ranks as one of the all time best live releases ever. Looking forward to the Astral Weeks “Front to Back” show at the Bowl. “Madame George” from Astral Weeks, or something goofy like “I Wanna Roo You” from Tupelo Honey. Justin you know Van is going to perform Astral Weeks in its entirety in the near future right? Cant remember the exact date hes performing the album. According to Billboard.com, Van Morrison is set to perform his 1968 album Astral Weeks in it’s entirety at two upcoming concerts at the Hollywood Bowl. The magic is taking place November 7-8 and the tickets, which go on sale Oct. 5th through Ticketmaster, will range from $75- $225.50. Morrison will be joined on stage by some of the original musicians who played on the album. p.s. My birthday is coming up in a week…cough cough hint hint. Those interested in Van’s earlier work, especially that underrated 1974 album Veedon Weeks, might be interested to note that Denison Witmer released a brand new cover of Comfort You just today as part of his ongoing Covers Project. Dennison Witmer is a whore. Back in those days I drove my VW Bus everywhere with ITLTSN blasting from the 8-Track car stereo. Van Morrison has always been able to touch my Celtic soul and over the years I’ve collected hundreds of his live concerts. In recent years his music has confused many of his fans by wandering off in various directions but now has “come home” by performing and recording a live version of his seminal work “Astral Weeks”. It was Astral Weeks and ‘Slim Slow Slider’ that made me a Van fan way back then. In fact it has, over the years, been a constant in my music playlist (CDs are a thing of long ago as now all of my music travels with me in digital format), so much so that a couple of years ago I did my own remaster of this album. Although Van’s people have sent ‘cease and desist’ letters to all of the music download sites, effectively stopping tapers from posting live Van music, I anxiously await the release of the live album that was recorded at Van’s Hollywood Bowl concerts November 6 & 7. 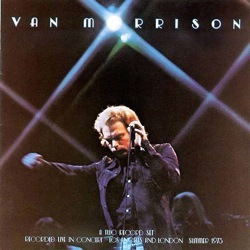 Live Van has always been the best Van – evidenced by ITLTSN, A Night In San Francisco, and the often bootlegged and downloaded ‘From Dublin Up To Sandy Row’ (recorded live at the Point in Dublin back in 1995 where he performed much of Astral Weeks Live). Van, based on the live track playing on your official web site, which hopefully came from your Hollywood Bowl concert, you’re still the man.